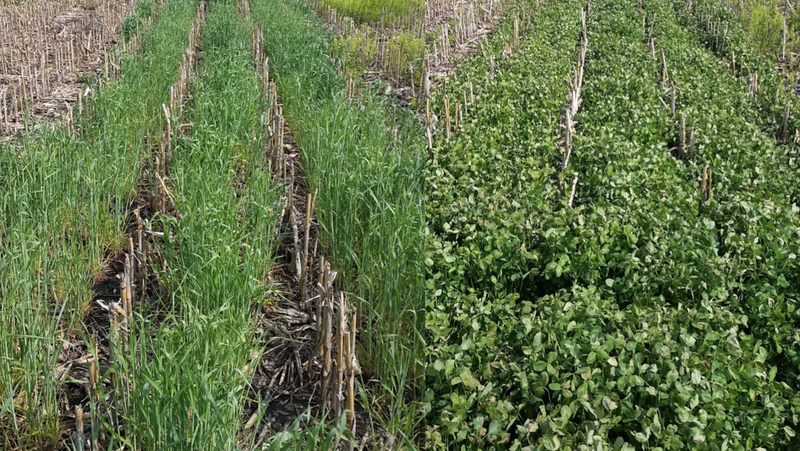 As many are aware, cover crops can provide growers with erosion control, reduce offsite movement of nutrients, support the development of soil organic matter, and in some cases provide additional revenue streams (e.g. forages, oilseeds). Even though cover crops offer several opportunities to growers who utilize them, historical, adoption has been marginal. It is estimated that less than 2% of the agricultural land in MN utilizes cover crops at some point in the rotation. There are several reasons for low adoption rates, but the most obvious reason is associated with the shorter growing season when compared to our neighbors in the South. The reduced growing season offers many challenges to successful integration of cover crops; however, there are new technologies that have the potential to overcome these challenges. The most notable technology involves early or late season cover crop interseeding (i.e. relaying cover crops into cash crops). Interseeding cover crops during the corn or soybean growing season can address some of the potential challenges (e.g. soil moisture and light) associated with shorter growing seasons. 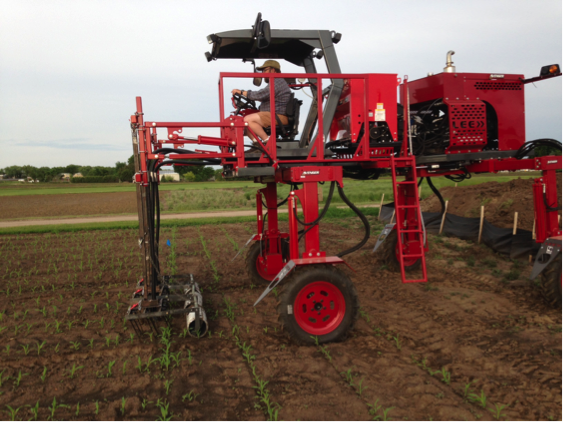 Currently the UMN Cover Crop team and Soil Health Partnership are researching innovative techniques, and equipment necessary to interseed cover crops in corn and soybean. When considering interseeding classical cover crops (e.g. rye, clover, radishes, etc), it is a good idea to review or at least acknowledge some of the core ideas from the discipline: weed science. This is not to say that the vast majority of disciplines associated with crop production, most notably: breeding, genetics, entomology, plant pathology, and soil fertility to name a few are not central to the advancement of cover crops. However for this discussion, the following example focuses on our knowledge of weeds and the similarities weeds can have with cover crops. Figure 1. Critical weed-free period impacts on crop yield. It is well known that weeds when allowed to compete with the cash crop can reduce crop yields. An important concept in weed management is the idea of critical weed free period. 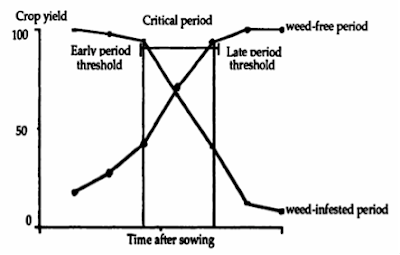 This is the time in the growing season when control or lack of control doesn't impact crop yield, and the critical free period of weed control is unique for each crop (Figure 1). Unfortunately the critical period varies widely depending on the specific conditions in each field, however, most agree that the critical period of weed control in corn is between the V1 and V10 leaf stages. Since cover crop interseeding does involve additional field operations, economically speaking, it makes sense to combine cover crop interseeding with scheduled cash crop operations or tasks (e.g. planting cover crops at side dress). A natural question arises when considering the critical weed free period in corn and early season interseeding of cover crops is what are the impacts on corn growth, development, and subsequent yield? In general, a weed is thought of as a plant out of place. Could cover crops be thought of as a weed? Since like weeds, both crops and cover crops productivity directly relates to the ability to sequester nutrients, water and light. So in this context, an early planted cover crop could be considered as a weed. Given that cover crops, depending when they are planted could exhibit weedy characteristics, we now come full circle and ask when is it less risky to interseed cover crops in corn? Most of the literature suggests early cover crop planting dates that aligns with the V5 – V7 corn leaf stage have negligible impacts on corn yield. 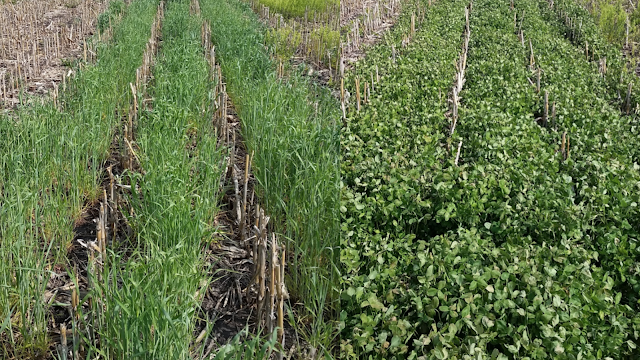 Our MDA funded cover crop interseeding project has demonstrated similar trends, where the no-cover-crop check plot yielded the same as the cover crop plots across the last two years, and there has been no yield reductions associated with the following no-till soybean crop (Figure 2). Figure 2. 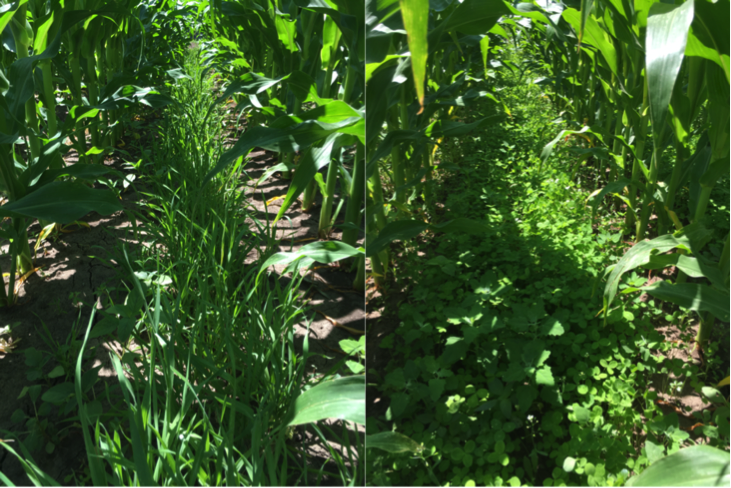 Cereal rye (left) and medium red clover (right) cover crop planted with 3-in-1 Interseeder into previous corn crop at growth stage V7 in Waseca, MN (Photo taken June 19, 2016 prior to no-tilling soybean). Targeting the V7 corn growth stage can position the cover crop planting date near the end of the critical weed-free period in corn (Figure 1). Still we have not answered the question, how early can cover crops be interseeded in corn? Said another way, how much flexibility is there associated with early season interseeded cover crops? This year at the Institute for Ag. Professional Field School hosted on the University of Minnesota St. Paul campus (July 29-30), the questions “How early should cover crops be interseeded into corn” is explored. Utilizing a high-clearance planter outfitted with a Gandy Orbital Air Seeder (provided to the UMN Cover Crop Team by Gandy), and prototype soil disturbance units (Figure 4), cover crops were interseeded at corn corresponding to the V2, V5, and V7-V8 growth stages. Figure 3. Avenger high-clearance adjustable tractor outfitted with Gandy Orbital Air Seeder and soil disturbance units. After each seeding event, there was sufficient rain event, which greatly impacted the germination and establishment of the cover crops. Currently, the corn across the three cover crop planting dates visually shows no stress. It is important to note, that the site has high mineralization potential and coupled with regular rain events may mask any “weedy” interfere associated with the V2 planting date. As we progress through the season, there is a good chance that grain yields will be reduced in the V2 treatments. Only time will tell. The following photos were taken June 10th (Figure 5 and 6). Figure 4. Cereal rye (left) and medium red clover (right) interseeded at corn growth stage V2. Figure 5. 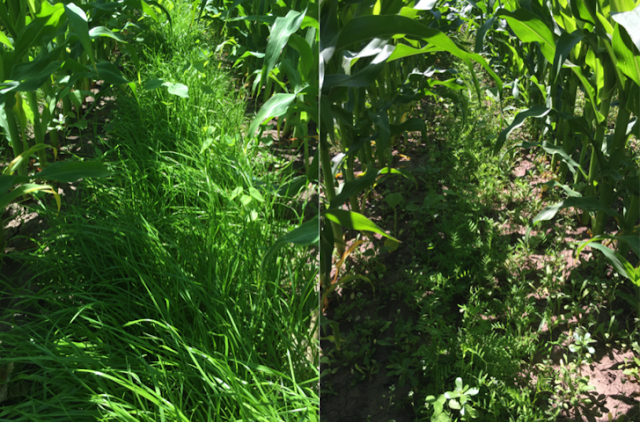 Annual ryegrass (left) and hairy vetch (right) interseeded at corn growth stage V2. Set your expectations low and be conservative. With all systems there is associated risk, and cover crops are no different. Determine what services most interest you (e.g. erosion control, reduction of offsite movement of nutrients, grazing, etc). Doing so will aid in the decision on which cover cropping system best fits your desired cropping system needs. Have a plan. For example, if cover crops are seeded into soybean, and they are winter hardy, what is the plan for planting corn not only in high-residue, but also void of fall tillage. Strip-tillage is a viable option for many corn and soybean growers. Be prepared to move quickly in the spring. Cereal rye can add on biomass quickly in the spring, and legume cover crops that survive the winter can be tricky to terminate with herbicides. Start with the basics. Cereal rye is bulletproof and relatively inexpensive. It establishes well in summer and in the fall, is winter hardy, and is easier to terminate in the spring than the legumes. If are new to cover crops, or any new technology, pick a uniform spot in your field and plant with and without cover crops. Keep everything else constant. With yield monitors, and adequate replication, you can assess if cover crops are a good fit for your farm. Reach out for help and advice. There are several in your state that can address your questions. UMN Extension, NRCS, MDA, USDA to name a few.